In the aftermath of the 2012 Tazreen and 2013 Rana Plaza factory disasters(1) all interested parties were agreed that the garment industry had to finally make major changes to working conditions in order to guarantee stability and industry expansion and to improve Western consumer perception of clothing brands. Local and foreign governments, NGOs, garment buyers, employers and unions have both cooperated and disagreed on what measures must be taken. One US NGO, the Solidarity Center, has recently become prominent in advising existing and emerging new unions. Before we analyse further its role we’ll describe a brief history of this organisation to try to determine its present function and goals. In 1997 the main US union federation, the AFL-CIO, merged its four international regional labour institutes to establish the American Center for International Labor Solidarity (ACILS), commonly known as the Solidarity Center. With the end of the Soviet bloc AFL president John Sweeney, supported by some activists, sought to now distance the AFL’s international work from its traditional anti-communist Cold War role. Though often little-known by its rank’n’file membership, the AFL-CIO has a long tradition of political intervention abroad - which began in the early 20th century with AFL leader Sam Gomper’s role in influencing US policy in the Mexican revolution. This role intensified after WWII during the Cold War and climaxed in the successful collaborative efforts of the AFL-CIO, CIA and the Vatican to aid the Polish Solidarność/Solidarity union when it emerged in the early 1980s(2). There has also been evidence of numerous collaborations with the CIA and local allies to destabilise governments in such places as Brazil, the Dominican Republic, Allende’s Chile, Nicaragua and, more recently, Venezuela. The Solidarity Center (SC) maintains field offices in 20 countries around the world. Though the official stance is that the SC is an independent NGO the funding tells a different story. Over 90% of SC’s $38 million budget comes from the US State Department with the US federal government channeling these funds via the US Agency for International Development (USAID) and the National Endowment for Democracy(NED). Only around $500,000 comes from AFL-CIO itself. The National Endowment for Democracy describes itself as “a private, nonprofit foundation dedicated to the growth and strengthening of democratic institutions around the world”. Yet it is primarily funded by the US Congress and is effectively a tool of US foreign policy. It promotes governments, parties, unions and groups that are US-friendly and those that oppose forces seen as antagonistic to US interests. Labour unions are seen as important channels for this; as institutions of civil society they encourage social stability, productivity and (usually) respect for the rule of law – all key goals of the democratic governance the US state seeks to promote in its sphere of influence. They can also harness a large constituency of members and target where members’ political support is placed. Depending on the desired outcome AFL-CIO, its Solidarity Centers (and its predecessors) have sometimes promoted highly politicised union movements to destabilise regimes ‘problematic’ to US policy – while at other times promoting apolitical unions restricting activity to the arena of bread’n’butter worker-employer relations which would be no threat to US-friendly regimes. In the specific case of Bangladesh the US appears concerned to try to stabilise the country’s political arena and civil society – which has been turbulent and unstable, punctuated by periodic suspensions of democracy, ever since the nation state was born in the aftermath of the 1971 War of Independence resulting in the breakaway from Pakistan. Those pan-Islamic forces who resent the more secular society of an independent Bangladesh remain a powerful and often militant, if minority, national political force. The US is concerned that internal unrest does not lead to a “failed state” in the country where an ideal strategic location and terrain could become a regional haven for Islamic (and possibly other) terrorism. Nor does it want to see established an Islamic state antagonistic to US interests and allied with its rivals. South East Asia is also increasingly an arena where the US and China are contesting for regional influence. Bangladesh – a democracy with a Muslim majority and economic growth averaging six percent GDP over the past decade - is considered a bright spot in South Asia by Western observers. The Bangladeshi garment industry is the main generator of this growth and has a workforce 80% female. This employment in urban factories has changed the life options for millions of young women and partially overcome the restrictions imposed by traditional Islamic and village values on women. The new intense and dangerous factory exploitation of low paid wage slavery is no liberation for women but it has given opportunities to escape and undercut some of the older social conservatism. Solidarity Centre and NED know that trade union blocs with mass memberships can function as important leverage tools in the political arena; their backing in political contests – whether elections or coups - can help tip the balance towards desired outcomes for US foreign policy. The imposition of the US neo-liberal ‘free market capitalist’ vision for developing countries ideally desires a democratic political framework – it is obviously harder to influence political forces, bargain and play off rivals against each other and influence ideological debate in a dictatorship. Policy makers now consider more authoritarian regimes as politically and economically less cost-effective and less conducive to the modern global economy. In the contest with China for regional influence in Asia the ideological promotion of democracy - in contrast to the long rule of the one party Chinese state - is perhaps a factor too and democracy is also seen as a buffer against one party Islamic statism. These three essential elements of a free nation -- representative government, a well-functioning market, and civil society -- work like three legs of a stool. They lift and support nations as they reach for higher standards of progress and prosperity. ... it is imperative to note the partnership between the State Department and the Solidarity Center toward fulfilling foreign policy objectives of the American administration. This partnership was well pronounced on March 10, 2010 by the acting Assistant Administrator, Bureau for Democracy, Conflict and Humanitarian Assistance of the U.S. Agency for International Development (USAID) – a sub division of the State Department – Susan Reichle at a testimony given before a joint hearing of the Subcommittee on Terrorism, Nonproliferation and Trade and the Subcommittee on International Organizations, Human Rights and Oversight Committee on Foreign Affairs of the U.S. House of Representatives. She said: “USAID's efforts to increase democracy in the work place have been largely implemented by our partner, the Solidarity Center. Together, we have focused primarily-though not exclusively-on promoting core international labor standards, encouraging freedom of association and collective bargaining, and strengthening the capacity of democratic labor unions to represent workers' interests and concerns both in the workplace and in public policy. Among the programs she outlined the following was one: Support the development and strengthening of free and independent labor unions and other labor-related organizations in their efforts to support and enhance democratization, equitable economic development and a democratic political culture through encouraging effective citizen participation (especially among marginalized populations and vulnerable groups. Then she said what the State Department-USAID endeavor to achieve through the Solidarity Center: Support for labor-enabling environments also includes emphasis on rule of law, human rights; freedom of association to form worker and employer organizations; promotion of competitive and well-regulated market systems; and support from government institutions. Initiated in mid-2007, the USAID official told the Congress, the Global Labor Analytical Initiative which was undertaken to systematically review United States labor programming established a cross-sectoral and cross-disciplinary framework for understanding the labor sector and its contributions to U.S. foreign assistance goals, including promotion of civic participation, broad based economic growth, and political accountability. Governance: Worker organizations, employer organizations and nongovernmental organizations may find common ground in promoting good governance. They often have acted on their common interests in promoting predictable rights- and rules-based systems. For example, there is a role for labor to play in anti-corruption efforts. Most of the newly registered garment unions in Bangladesh are affiliated to the Solidarity Centre; SC provides funding for paying organisers’ wages and is helping unions negotiate the government registration process. Those unions – often more leftist - seeking a more independent existence claim that their applications for registration are being rejected while SC-backed unions are accepted. The professional expertise and US state backing ensures SC affiliates a more sympathetic hearing – while the smaller leftist groupings, being more cynical of NGOs and of less interest to NGOs as potential loyalists to US foreign policy, are easily excluded. Most of the country’s RMG trade unions are reportedly controlled by workers’ federations affiliated with US-based non-profit organisation Solidarity Centre, with many labour leaders and factory owners raising concerns that the sector might become a hostage to a vested quarter. According to the Labour Ministry, 152 trade unions have registered following last year’s Rana Plaza disaster. There are allegations that 142 of those unions were linked with nine federations “affiliated” with the Solidarity Centre. 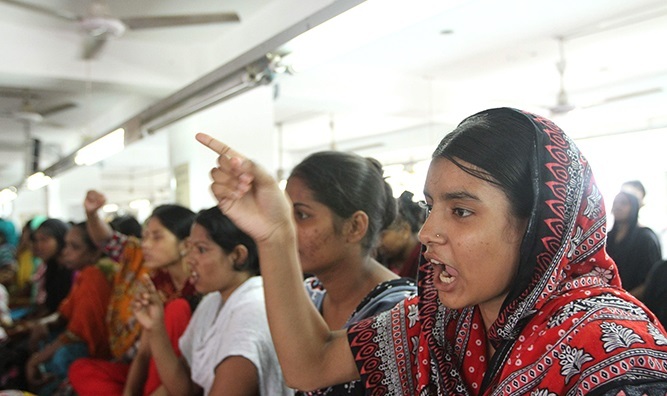 Bangladesh Garment Manufacturers and Exporters Association accused Bangladeshi union leaders this week of undermining the nation's image and garment industry by asserting that some labour leaders and pro-union workers have been tortured, beaten and harassed. The bosses’ arrogance blinds them even to what is appropriate and diplomatic for them to say in public at this sensitive time. The BGMEA statement was strongly criticised by exasperated US officials – who are clearly having a hard time keeping garment bosses “on-message” for the promotion of ‘democratic values’ (or for at least maintaining the appearance of some commitment to them). One can predict that the new union movement will be dominated by those who already have links with Western NGOs or have the professional skills and resources to cultivate them; it will be organisation of workers from above by educated middle class specialists in representation rather than workers’ self organisation. Those who are comfortable allying with the very moderate and reformist NGOs will have little interest in any radical agenda. “It is dangerous if most of the trade unions are under the control of a vested quarter. The whole sector would be hostage to them and they can create anarchy at any time in the sector,” Reaz Bin Mahmood, vice president of the BGMEA, told the Dhaka Tribune. Till now employer resistance has meant unions have only functioned as NGOs and lobbyists rather than as workplace representatives and negotiators. The demand for “unions with the “real” presentation of “real” workers” may simply reflect that if bosses must accept unions then they at least want them to be genuine representatives able to deliver workers’ obedience to any settlements and deals negotiated. But that begs the question of whether in their new role unions will be able to assert much control over garment workers – and that is probably partly dependent on whether bosses are willing to negotiate and concede long term improvements in wages and conditions and so allow unions to be seen as having some use for workers. Thanks to the bosses’ refusal of unions in the workplace workers now have over 30 years of experience in militant self organisation without the mediation of union representation. This is a militancy that both bosses and union leaders want to tame to protect their investment in the ‘national economy’ and their social status. It’s possible that the resistance of bosses to unions - regardless of workers’ formal legal right to organise and despite pressure from Western powers to accept this ‘democratic norm’ - will make unions of limited use to workers. The moderate reformism of a largely middle class union leadership – influenced by their paymasters like the Solidarity Centre – may also quickly breed in workers a cynicism about ‘their’ representatives who have appointed themselves to bargain in their name. The price of a life - pay up! Many of the survivors and the relatives of dead victims of the April 2013 Rana Plaza and November 2012 Tazreen factory disasters are still waiting to be paid their final compensation settlements. Most have received partial interim payments but are suffering unexplained delays; some of the money apparently still sits unused in a government fund. Despite their massive profits from the blood and sweat of these workers the BGMEA bosses’ federation have complained that the requested compensation pay is too high and have dragged their heels over paying up; while some foreign clothing buyers, such as US company Walmart (net worth $446.950 billion), simply deny any obligation and refuse to pay any compensation(6). As most of the country has stopped work to celebrate the Eid religious holiday, workers at the Tuba Group of factories have been laying siege to their employers’ HQ demanding payment of several months wages owed. Tuba owned the Tazreen factory where 112 workers died in the 2012 fire and the owner Delwar Hossain is in jail awaiting trial on charges relating to the deaths. As Eid approached workers at four Tuba factories began to suspect that, after earlier broken promises, they would not receive their back pay nor the usual holiday bonus. So for several days 1600 workers have laid siege to the BGMEA offices, trapping Tuba bosses inside. They have also surrounded Tuba HQ and trapped several relatives of the owner inside. The company is in serious financial trouble – but, with banks refusing loans to Tuba, neither the BGMEA nor government has offered to step in to relieve the workers’ hardship, despite their clear financial ability to do so. The Tuba workers are also demanding immediate payment of full compensation for Tazreen victims, that the bail granted to Hossain last week should be scrapped (they allege that their wages have been withheld as part of the BGMEA’s pressure to secure him bail) and a death penalty sentence, medical and psychological treatment for those hunger strikers fallen ill and that Tuba factories should be kept open to provide them with paid work. The 1600 workers have now occupied three Tuba factories and on Monday began a hunger strike to secure their wages. Malnutrition is common under normal conditions among poorly paid garment workers and 86 fasting workers have already been hospitalised. They say they will “fast unto death” if necessary. If it comes to that, a few more deaths can be added to the tally of lives consumed in the ruthless pursuit of capitalist profitability in the garment trade. Yesterday, 2nd August, as the hunger strike entered its sixth day a demonstration of strikers and supporters, including various left parties, was met by a massive police deployment. The strikers’ organising committee has vowed to begin a nationwide movement if their demands are not met. At the same time that that AFL-CIO was officially opposing the 2003 occupation of Iraq Solidarity Center personnel were ‘embedded’ with invading US troops. Once installed in the country they gave recognition only to the sole Iraqi union federation that supported the military occupation. This support for one federation over others was criticised by union activists as in contradiction to AFL-CIO’s long-held commitment to workers’ “freedom of association”; i.e. the principle that workers should be free to choose which union to represent them. Yeah, great piece, unfortunately I have only just got round to reading it. Do you know what has happened with the Tuba workers' protests? Very interesting stuff about AFL-CIO and the Solidarity Centre: I knew the latter was basically a tool of US foreign policy but did not realise that its funding was so blatant! The Tuba workers have been partially paid wages owed. But in the past couple of days the owner Hossain - recently released from jail - has closed down some factories as a way of trying to avoid paying some workers. So they struggle on, using both protest and legal action. I might do a follow up article.